We know that your privacy is very important to you. 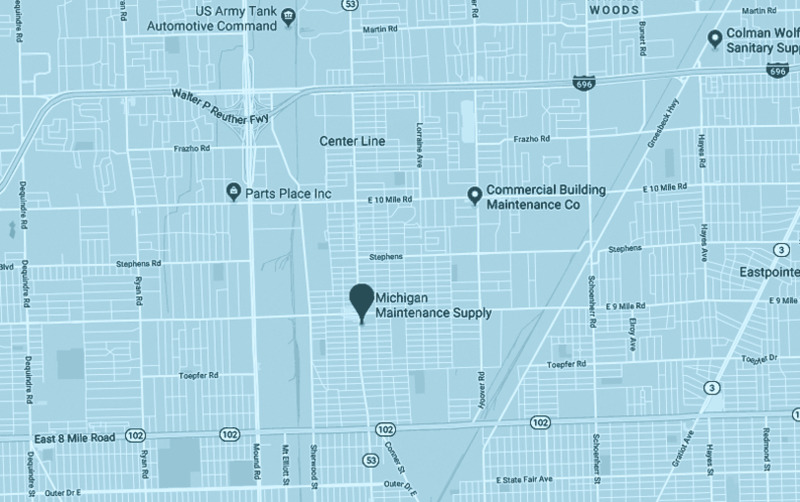 That's why protecting any personal information, such as your name, address, e-mail address or phone number that you provide to us is of the utmost importance to Michigan Maintenance Supply Company, Incorporated ("MMS"). As a result, we have prepared this Privacy and Security Statement to let you know about the manner in which we collect, use, disclose and otherwise manage the personal information you entrust to us at our storefront location (the "Store"), through our Call Center (the "Call Center"), through MMS websites (the "Websites"), or through our authorized service providers ("Service Providers"). When you provide personal information at our Store, our Call Center, our Websites and to our Service Providers, you are consenting to the manner in which MMS will collect, use, disclose and otherwise manage your personal information, as set out below. When you purchase products and services at our Store, you can do so anonymously when you pay with cash. If you use a credit or debit card for any of your purchases, we will collect your credit or debit card information and keep a history of your purchases. We use this information to process your orders, to ensure proper delivery, to better assist you when you visit or call us as well as to improve our product and service offerings. Call Center: When you call our Call Center about a product, delivery, an installation, a billing question or for customer service, you may be asked for information that identifies you along with additional information we need to help us promptly answer your question, such as your name and address and a phone number where we might contact you. We may retain this information to assist you in the future. Online Registration: Registration is an optional service provided by our Websites. You do not have to register to browse or shop online. When you register, you are asked for personal information such as your name, address, phone number, e-mail address, a password that you select, and optionally, your interests. Your registration information may be used to help make your online shopping quicker and easier, by pre-filling certain parts of your shopping information. When you register you will have the opportunity to sign up for future marketing information from MMS. Contests, Questions or Surveys: When you ask a question, participate in a survey or enter a contest or sweepstakes at a Store, a MMS sponsored event or through our Websites, we may collect your name, address, phone number and e-mail address. We use this information to administer your participation in a contest or sweepstakes. At the time you are entering a contest or sweepstakes, we may ask your permission to send you future marketing information from MMS. Other Uses of Personal Information: MMS uses personal information, including information provided to us from our Service Providers, to continually assess and improve the products and services we offer. We would also like to inform you of products and services, sales and special offers that might benefit you. When you register online or participate in a survey, you will have the opportunity to sign up for e-mails about our products, services, sales and special offers. We may also send you mail, e-mail or call you with information about our product and service offerings if you have provided us with your name and address, e-mail address or phone numbers at our Store, Call Center or Websites. If you would like to stop receiving such promotional information from MMS, please see the Privacy Preferences/Opt-Out section of this Privacy and Security Statement or go to www.homedepot.com/privacypreferences for further instructions on how to register your preferences. Your Suggestions: We use your feedback, suggestions, survey information and comments solely to monitor and/or improve the use and features of our Store, Call Center, our Websites and our product and service offerings. California Privacy Rights: Pursuant to Section 1798.83 of the California Civil Code, residents of California have the right to request from a business, with whom the California resident has an established business relationship, certain information with respect to the types of personal information the business shares with third parties for those third parties’ direct marketing purposes and the identities of the third parties with whom the business has shared such information during the immediately preceding calendar year. To exercise your rights, you may make one request each year by emailing us at privacy@michiganmaintenance.com. You may also see a copy of our information disclosure practices by reading the “Disclosure of Personal Information” section of this Privacy and Security Statement. MMS Websites are not intended for use by children under the age of 18. We do not knowingly collect personal information from children under the age of 18. Personal Information Disclosure: MMS will not trade, rent or sell your personal information, without your prior consent, except as otherwise set out herein. MMS Financial Products: MMS uses Service Providers to offer financial products, such as vehicle financing. We may share personal information about MMS consumers with these Service Providers in order to provide you with tailored information about products and services and special offers. These Service Providers also have their own privacy statement that sets out the manner in which they will collect, use and disclose personal information. We encourage you to review each Service Provider's privacy statement at the time you submit your application for such services. Extended Warranty Services: If you purchase a MMS Extended Warranty Service you will be required to provide information such as your name and address to our warranty Service Provider. While these Service Providers are limited by contract in the way they may use your information to provide MMS Warranty Services, we encourage you to review the Service Provider's privacy statement at the time you submit your personal information for such services. Other Service: To serve you better, we may combine the personal information that you give us on our Websites and at our Store or through our catalogs with publicly available information and information we receive from or cross-reference with our marketing partners and others. We use that combined information to enhance and personalize your shopping experience with us, to communicate with you about our products and events that may be of interest to you, and for other promotional purposes. If your purchases are being shipped to you, we will share your shipping information on a confidential basis with our delivery service providers (United Parcel Service, United States Postal Service, Canada Post, or other delivery companies we or you select). Our delivery service providers are prohibited from using your personal information for any purpose other than making the delivery. Sale of Business: MMS reserves the right to transfer any information we have about you in the event we sell or transfer all or a portion of our business or assets to a third party acquirer. Legal: Please note that MMS must provide your personal information in response to a search warrant or other legally valid inquiry or order, or to an investigative body in the case of a breach of an agreement or contravention of law, or as otherwise required by law. We may also disclose personal information to assist us in collecting a debt owed by you. You may request access to the personal information that we have about you. As a registered user with our Websites, you can access your profile information at any time by clicking on the "login" link at the top of any page on the Websites on which you registered, then clicking on the links below the "My Account" heading. For further instructions on accessing the personal information that MMS may have about you, please see the How to Contact Us section of this Privacy and Security Statement. Visiting Our Websites: In general, you can visit our Websites without telling us who you are or providing us with any information. However, we collect the IP (Internet protocol) addresses of all visitors to our Websites and other related information such as page requests, browser type, operating system and average time spent on our Websites. We use this information to monitor and improve our Websites. Cookies: Our Websites use a technology called "cookies". A cookie is a tiny element of data that our Websites can send to your browser, which may then be stored on your hard drive so we can recognize you when you return. All pages on our Websites where you are prompted to log in or that are customizable require that you accept cookies. If you have registered with our Websites, these cookies (1) may let us know who you are, (2) are necessary to access your account information (stored on our computers) in order to deliver products and personalized services, and (3) will provide us and our service providers with information that we will use to personalize our Websites in accordance with your preferences. Cookies are also required to optimize your shopping experience in that they allow you to add multiple items to your shopping basket before checking out. You may set your Web browser to notify you when you receive a cookie. However, should you decide not to accept cookies from our Websites, you will limit the functionality we can provide when you visit our Websites. Tracer Tags: Our Websites may also use a technology called "tracer tags". These may also be referred to as "Clear GIFs" or "Web Beacons". This technology allows us to understand which pages you visit on our Websites. These tracer tags are used to help us optimize and tailor our Websites for you and other future website visitors. Third Party Links: Our Websites may include links to the websites of our business partners, vendors and advertisers. Except as provided herein, we will not provide any of your personal information to these third parties without your prior consent. MMS provides links to third party websites as a convenience to the user. The inclusion of any link does not imply MMS's endorsement of any other company, its websites, or its products and/or services. These linked websites have separate and independent privacy policies, which we recommend that you read carefully. We have no control over such websites and therefore have no responsibility or liability for the manner in which the organizations that operate such linked websites may collect, use or disclose and otherwise treat your personal information. We will maintain the confidentiality of all personal information collected in our Store, our Call Center, our Websites and from our Service Providers and will only disclose such information to employees and Service Providers who require such information for the purposes described in this Privacy and Security Statement. We maintain administrative, technical and physical safeguards to protect against unauthorized access, use, modification and disclosure of personal information in our custody and control. Secure Shopping: When you place orders on our Websites, all of your order information, including your card number and delivery address, is transmitted through the Internet using Secure Sockets Layer (SSL) technology. SSL technology causes your browser to encrypt your order information before transmitting it to our secure server. SSL technology, an industry standard, is designed to prevent someone other than operators of our Websites from capturing and viewing your personal information. Passwords: To provide you with an increased level of security, online access to your personal information is protected with a password you select. We strongly recommend that you do not disclose your password to anyone. MMS will never ask you for your password in any unsolicited communication (including unsolicited correspondence such as letters, phone calls or e-mail messages). Order Information: Since any order information you provide to us on our Websites will be transmitted using a secure connection, if your Web browser cannot support this level of security, you will not be able to order products through our Websites. No data transmission over the Internet can be guaranteed to be 100% secure. While we strive to protect your personal information from unauthorized access, use or disclosure, MMS cannot ensure or warrant the security of any information you transmit to us on our Websites.